As any Stogie Guy should know, when it comes to cigars, thicker isn’t necessarily better. Each year, nonetheless, stogies get fatter and fatter…and this alarming trend towards quantity from quality is taking root in the cigar world with lightning speed. American smokers moved away from traditionally popular sizes in search of thicker cigars with more complexity and cooler smoke. By the early 1990s, the robusto was the country’s most popular size, and thinner cigars had begun to be relegated to the back of the cigar-smoking consciousness. 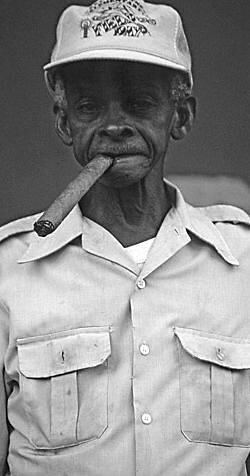 Today, thick cigars are even more popular. Cigar Aficionado’s RTDA Blog Day 3 reports that this year’s convention is inundated with fat sticks. The Maxx by Alec Bradley has a new 60 ring smoke called The Freak. And CAO has one of the thickest ever made – a 96 ring Brazilia-Italia (they cut it down from a 137 ring gauge). That’s just obscene! Couple these introductions with Lars Tetens’ new 60 ring Gorilla Fingers, and you could argue 60 is the new 54. But before we jump headfirst on the thicker-is-better bandwagon, let’s not forget some oft-overlooked vital facts. Fat cigars are awkward in the hand and tragically uncomfortable in the mouth. And these mammoths tend to burn so cool they are often difficult to keep lit. Finally, and perhaps most importantly, their behemoth size actually tempers most of their flavors. Case in point: Remember that the best tobacco on any cigar is the wrapper. By choosing thinner cigars (like the 40-46 ring gauged coronas, lonsdales, and Cuban corona gordas), you get more wrapper in relation to filler. While these cigars typically burn a bit hotter than their fat counterparts, you get richer, fuller, and more pronounced flavors. Simply put, a smaller smoke can deliver a taste experience that is often lost in the girth of larger cigars. Also, thin cigars peak much quicker, delivering their flavor without the long wait that many thick stogies require. So while the entire cigar world plunges into a trendy fascination with fatness, I’m encouraging Stogie Guys Nation to plunge with caution. Like Pogs, it’s only a phase. Much like women, thick ones can be a lot of fun from time to time, but let’s not forget how flavorful and classically-beautiful a thin one can be. When you measure in kilograms instead of RG you know it’s big time. I wonder if some of this trend comes from the push of the 90’s when everyone and their mothers were making cigars. Small cigars seem to be harder to make with a good draw (in my experience.) So to make sure you don’t get labeled as having a bad draw, just make it bigger. That last line in the post is pure genius. Well done, sir. Is that really a Pogs reference? 96 ring seems a bit on the extreme size, but my favorite cigar (at the moment) is the La Flor Dominicana Ligero L-500 Cabinet, which is 60 ring by 5-3/4. It is a powerful, incredibly flavorful smoke with hints of dark chocolate. I've had several other sizes in the Ligero line and, while still good, none was nearly as pleasurable as the L-500.